This week we took a short trip to Niagara Falls for a little vacation time. I hadn’t been since I was a kid. I would advise anyone that hasn’t been there lately to get up from your computer this very minute, jump in your car and go! We had a great time. We forgot to get passports in time, so we did the American side only, but found that there was more than enough stuff to keep us busy. And the park area around the falls is gorgeous. Very clean, serene and kept in a natural state. In case you go, there are a few things you need to know. 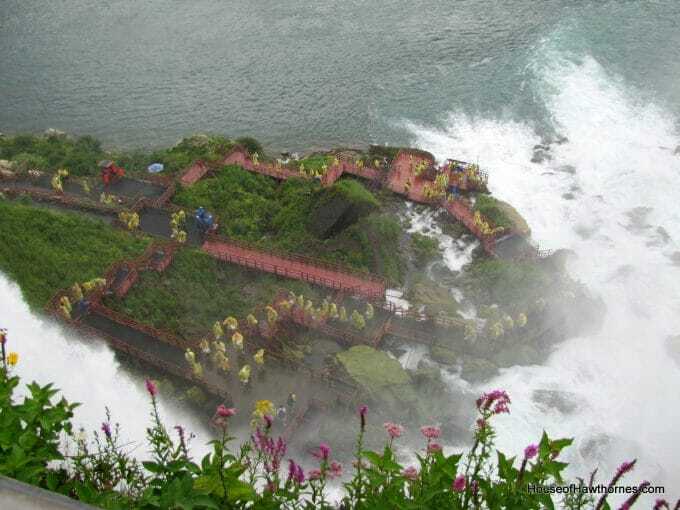 Cave Of The Winds – you climb around on wooden walkways perched precariously on the rocks at the bottom of the falls. They give you a free rain poncho and a pair of really spiffy sandals. You get wet anyhow. 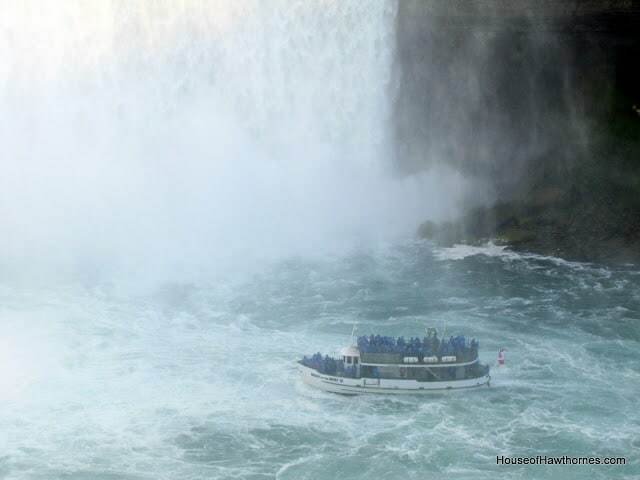 Maid Of The Mist – you take a boat ride to the churning waters at the base of the Horseshoe Falls. They give you a free rain poncho, your shoes are on their own. You get really, really wet anyhow. You come close to dying. Three Sisters Islands – a set of three picturesque islands located adjacent to Goat Island. Watch where you walk or you will slip and fall into the water. 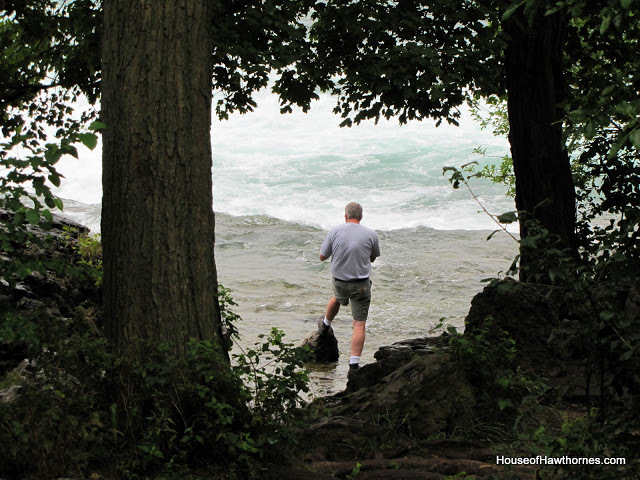 Since they are a mere 500 yards from the top of Horseshoe Falls, it is not advisable to have any slippage. Remind your husband of this fact, so he won’t be standing on a rock in said water trying to take a picture of his foot dipped into the water when you turn your back for ten seconds. Since I didn’t want to turn this into the equivalent of sitting around Uncle Ed’s house looking at a slide show of his trip to Yellowstone, I set up a Picasa photo album that you can check out if you want. And in case you’re wondering, the green door was part of an old hydro-electric power plant on Goat Island. I thought it was a really cool old door in a great vintage green color. I wanted to bring it home with me, but with the park rangers still eyeing my husband for the foot photo incident, I thought we should be on our best behavior. I have yet to check out Craigslist for garage sales today, so I better get going. Have a great weekend! Cool! Did you see my summer pics, this is exactly what we did too. We have always done the Canadian side, because it was easy then to get over. I really enjoyed the American side though. The cave of the winds was sooooo much fun. Thanks for sharing, great pics Pam. I would love to go to Niagara Falls, especially after seeing your beautiful photographs! Sounds like a need to bring a waterproof wardrobe, however! 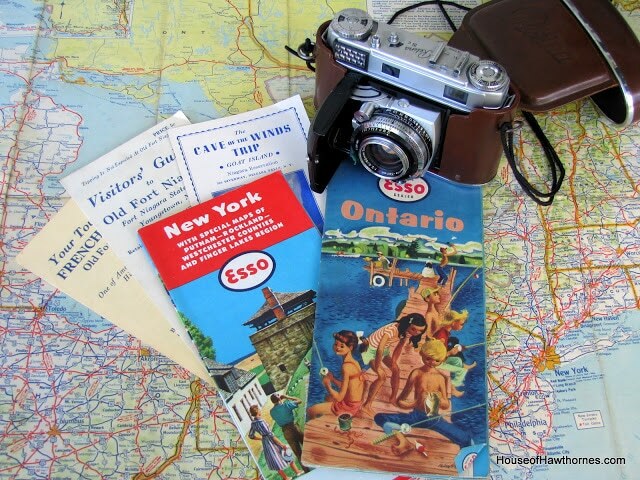 My parents went there on their honeymoon back in 54. I have never been and probably won’t now since I cannot travel great distances. Love your photos. Glad you had a great time Pam! I love all the photos!!! I still have nightmares of my trip to Niagara Falls as a child with my parents. At the wax museum there was a statue of a lady who went over the Falls in a barrel. She spooked me into thinking I’d fall over too. Who wakes up and thinks, “now today looks like a good day to climb in a wooden bucket and navigate rushing water.” Nonetheless, your pictures are beautiful! Glad you all had a good time! Sounds exciting and a little scary!!! Glad you had a good time…the pictures are great!!! I love Niagara Falls and went to the American side for the first time a couple years ago! It is so beautiful and much less touristy than the Canadian side! We loved it!! Three years ago we vacationed in Canada. We took a day trip to Niagra. I had never been there before. I loved it! We did everything you showed pics of. It’s always fun getting wet! Glad you got to go! I looked at all your pictures and I must say they make me want to go back right now! I spent a few days on the Canadian side about 4 years ago and have vowed to go back. You must see it to believe its awesome power and beauty. Thanks so much for sharing. Coming close to dying sounds like fun to me! What a great post, Pam! I have never been there…wow, it looks awesome! Your photos are gorgeous! Thanks for sharing them with us! Niagara falls is definitely on our must-do list for our family. I haven’t been since I was a little girl. It’s time to go back. The idea of Josie and those falls, does scare me. She’s a moving target. Beautiful pics, Pam. Oh my gosh you were in my neck of the woods, I am glad to hear you had a great time. You took some great pictures. Neat, Pam! Some day I hope to go there. My grandparents went to Niagra Falls on their honeymoon before taking a trip to Europe. My grandfather’s family hailed from around that area in the early 1800’s. I really want to go, not only for the beauty, but on a genelogy jaunt of sorts. Thanks for sharing with us. Our daughter lived in Buffalo and we went to Niagra Falls several times. It is awesome and you do need to do the whole nine yards!